Hello, my name is Patricia, I run Abelia Handbags and Textiles. 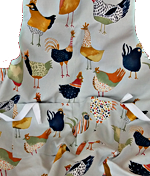 I make beautiful bags, cushions, aprons, bunting and other items from unusual and vintage fabrics. Each piece is unique, because the fabrics are lovingly sourced from offcuts and remnants, markets at home and abroad, and Ebay. Much of my work is in Harris Tweed. This a beautiful, hard-wearing fabric that is available in an infinite variety of colours and never goes out of fashion. 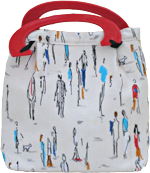 I make bags for every occasion: everyday handbags, shopping bags and beach bags, and bags for special occasions. My gorgeous cushions are made from either remnants of stunning fabrics which make statement pieces, or vintage white linen and lace, which look beautiful on a bed. Some are even made from vintage tablecloths which have seen better days, but have wonderful hand embroidery on the corners. I have also made some cushions from flowery furnishing fabrics, which are perfect for your garden benches or chairs, or even relaxing on the lawn. Buy from me at fairs and markets or contact me through my website. Discover a world of gorgeous coloured bags and cushions! Treat yourself or a friend to a lovely hand-made item. I exhibit at fairs and markets all over Kent and Sussex, see my News page for details. Alternatively contact me directly, or buy online.